Packaging: Sold as the pallet of 50 packages of brick. Each package of 20 bricks weighing approx. 40 lbs.. A one ton palette measures 48 x 48 x 42. Also sold at some stores by the package of 20 bricks. Size: 4 in. x 6 in.x 2.5. In season prices are expected to be higher. Jotul Castine F400 stove, rear exit to a 20' stack with draft Damper. Method: Build a starter fire teepee with 4 bricks. I used paper and pistachio nut shells as starter in one test and a SuperCedar in the second test. Once the bricks are going well, they get moved to the back of the stove and the remaining 9 bricks are stacked around the burning bricks. They are laid as flat and close as possible for a total of 13 bricks = 26 lbs. Like pressed logs, you want to be careful not to overfill the stove. There is a lot of energy in this product and using too much fuel risks overfiring the stove. If there is an ongoing fire that has burned down, one should only add 4 - 8 bricks to refresh the fire depending on the stove size. 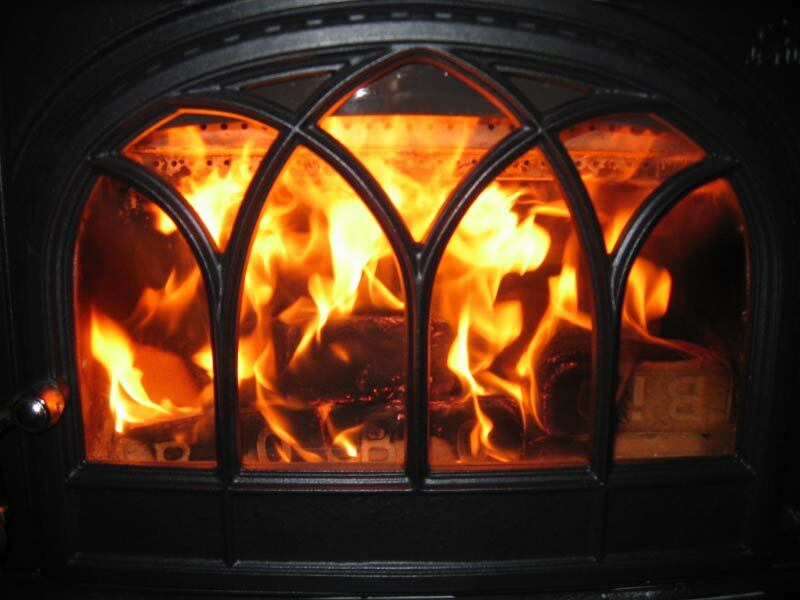 Treated with respect, pressed wood products are safe and convenient way to heat. 7:30 pm --- Starting --- temp 68 degrees, dampers wide open, door open about in. 8:45 pm --- Reading --- temp 600 deg. --- Action, close air control to , stack temp 400, full, billowing blue secondaries, logs black but little flaking. Puffing up about 20%. 10:00 pm Reading -- temp 450 deg., glowing bricks, burning hot around the edges (the last bricks to ignite). The BioBricks are a bit easier to start than the HomeFires or Idaho Logs, but still need a little kindling to get going. I had a batch of nut shells which work very nicely for the first test. In the second I used Supercedars which make it a no-brainer for easy starting. The flat brick design eliminates any problem with rolling. Quite differently from the pressed logs, the BioBrick literature says to pack the bricks in as tightly as possible and stagger stacking to eliminate air flow through the bricks. The idea appears to be for them to burn as a large mass. This ensures a longer, steady burn. I had a little problem getting a really tight packing due to the uneven grating floor in the Jotul. In a flat bottom steel stove this product would be ideal. The bricks puff up slightly as they burn, maybe 20%. They start to look like a loaf of bread in the oven. In my first test, as the front, bottom bricks puffed up, the top layer slid until it was against the glass and I had to do a little adjustment by pushing them towards the back. This was easy to prevent with the second test by changing the stacking order. Like the pressed logs, there was a bit of a learning curve to get the ideal burn for the stove. But it was pretty easy to figure out the best stacking by doing a dry run, before actually starting the second test burn. One small downside is that bricks being smaller, means more brick logs per fire. My sample was somewhat dusty and I had a small pile of sawdust to clean up after each loading. But in fairness, these bricks had traveled cross-country via UPS. It wasnt a big deal, but more noticeable than with the HomeFires which were the cleaned log Ive tested so far. The air control needs to be watched for the first hour as the logs start to outgas and combust. Due to the dense packing and probably experience gained with the other tests, the BioBricks were easier to regulate. I never had concern about a runaway fire. The dense packing gives a slower, steadier burn. In the second test, no adjustment was needed to the position of the bricks. By the next morning at 6:30 am, there were still some glowing coals. Had I added about 6 bricks around midnight, I would have had all-night heat and a good bed of coals to restart in the morning. Ash generation was low. It is a very fine almost granular ash, about 1/4 that generated by an equivalent amount of wood. Overall, I liked the product. I still have enough for one more test. Though its starting to warm up here, I think I will try one more burn on the next rainy day. I am going to try packing the stove cold, starting the block with a SuperCedar in a space at the front. This is the opposite of the instructions, but will be an interesting alternative test. It will allow me to pack the stove as tight as possible. I like the flat bottoms of the bricks. They dont roll unpredictably and allow tight packing. In a flat bottom stove, setting up a fire would be very easy. The bricks are slower to release initial heat, due to the dense stacking, but burn more steadily over a longer time. This means less fussing with the fire. A downside is that so far this is strictly a New England product. But there are a lot of stoves there and I encourage one to try them out, especially if you are buying wood anyway. If you live in a NE urban area, this is a great product. They store in much less space than cordwood with no bugs and burn much cleaner. Just keep them dry. I burned the last of the bio-bricks in a different way. As an experiment, I filled the stove with bricks while it was cold. I put in 15 bricks, which made me a bit nervous, because of the potential for a runaway stove with 30 lbs. fuel. But I packed them in tightly and each row was oriented the opposite of the one below it to reduce air passages between bricks and the layers. Then I started a small fire with kindling in front of the BioBrick wall. It was slower starting, but after 30 minutes the bricks were starting to burn well in the front middle. However, as Thomas had told me, the stove never went out of control. Within an hour it looked like all the bricks on the surface were burning, but the back lower bricks were not. This meant a very controllable fire. I started the fire at 7pm and went to bed at 1 am. The stove was still burning with good secondaries and at 550 at 1am. And when I came down the next morning the heat fan was still spinning and the stove was at 175 degrees. There were lots of coals that started glowing as soon as I opened up the air Damper. I wish I had a recording stove thermometer for these tests, but this is the first time that I have gotten a 5+ hr. sustained over 500 degree fire from compressed fuel without me doing anything more than dampering it down once the fuel is burning strongly and stove temps are over 500. 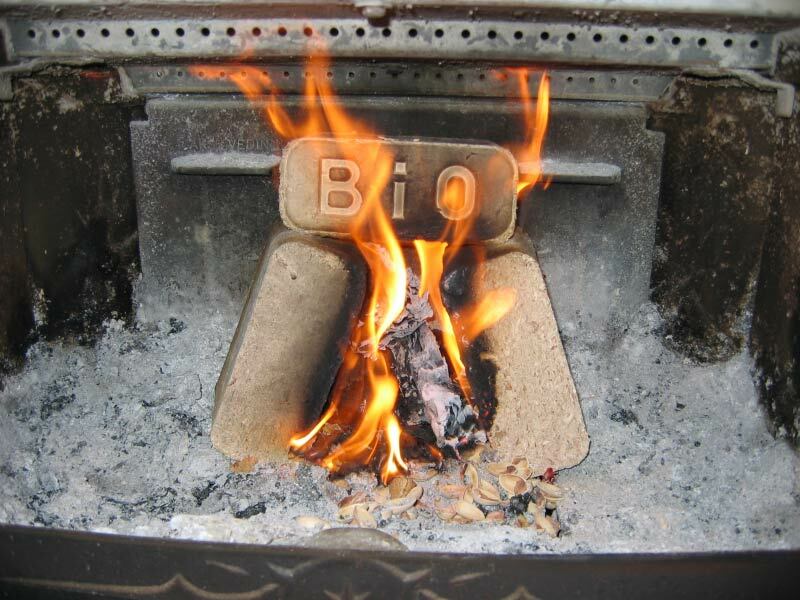 The unique sizing of the BioBricks allows one to pack the stove much better which slows down the burn.